Given the unique and tragic circumstances of this event, we will consider any application we receive for funding from the Metropolitan Police as a matter of priority. According to The Mail, less than one per cent of people caught with illegal drugs are jailed. The piece contains figures showing that of the 461,000 people caught possessing drugs in the last four years, only 4,374 received prison sentences. Peter Cuthbertson, founder of the Centre for Crime Prevention, claims people will be surprised about the “lax attitude” towards drug possession and the Government should not allow drugs to be decriminalised by the “back door”. 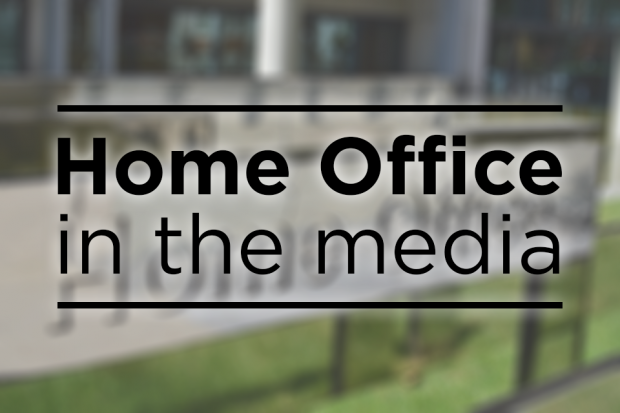 The Home office has advised the media that it is an operational matter for police forces to assess the appropriate response in drug possession cases, and that sentencing decisions are a matter for the independent judiciary. We have no plans to decriminalise drugs and are clear that drugs laws should be enforced. The Independent reports on comments made by the London Mayor, Sadiq Khan. He claims funding cuts to youth services, community groups, education, probation and police has “reversed decades of progress” and led to a rise in violent crime. Violent crime has devastating consequences on our communities and we are determined to tackle this head on. The Metropolitan Police will receive more than £2.5billion in funding and also has £240m of reserves to draw from. The Mayor of London is accountable to the public for Met’s performance and is empowered to raise local precept to increase funding. The Home Office will publish a new Serious Violence Strategy shortly and has launched a public consultation on new laws on offensive and dangerous weapons, which includes plans to restrict the sale of knives online and banning the possession of certain weapons in private.